Let’s Relax, Thailand’s Boutique Day Spa Chain, has opened its first branch in Phnom Penh, Cambodia. 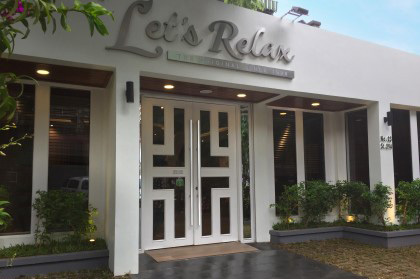 Immerse in the Authentic Thai Spa Experience from the moment you stepped in at our latest Let’s Relax Phnom Penh Branch 1, conveniently located on Mao Tse Toung Boulevard near the Phnom Penh CBD. Discover your Let’s Relax experience from March 8, 2018 onward. Let’s Relax Phnom Penh Preah Norodom Boulevard is a modern Thai Spa with unique aesthetics of style and texture. This stand-alone spa building stands out from the crowds in the busy Embassy neighborhood of Phnom Penh. The ambiance of Let’s Relax Phnom Penh Preah Norodom combined the city and nature concept together, creating a relaxed and tranquil impression for spa-goers. The design of this spa combined the relaxing colour of Grey, White and Wooden Design, conveniently located in the middle of Phnom Penh’s busy residential and commercial area. Let’s Relax Tonle Basic, on St. 294, offers the perfect spa experience for passer-bys. Inspired by the design of the Gallery, the interior design composed of multi-color flowers picture frames creating the refreshing feeling.